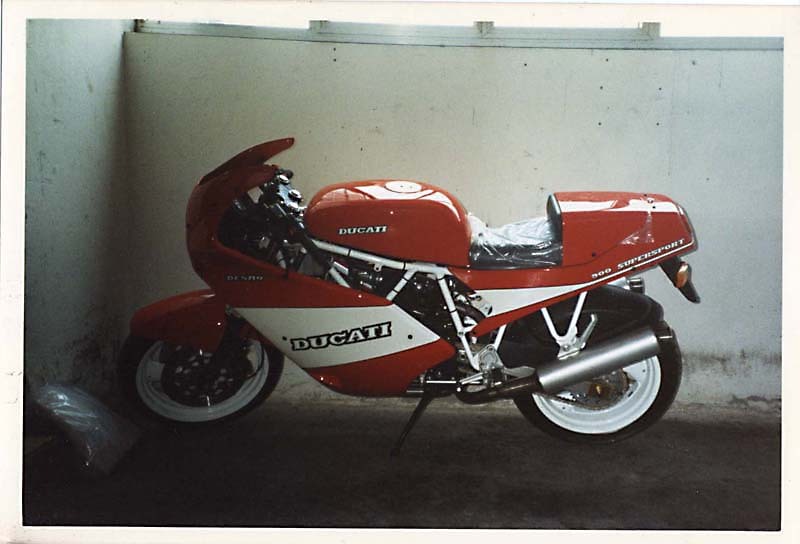 The 750 Sport "Nuovo" came out just as the Castiglioni brothers were taking over the Ducati name. 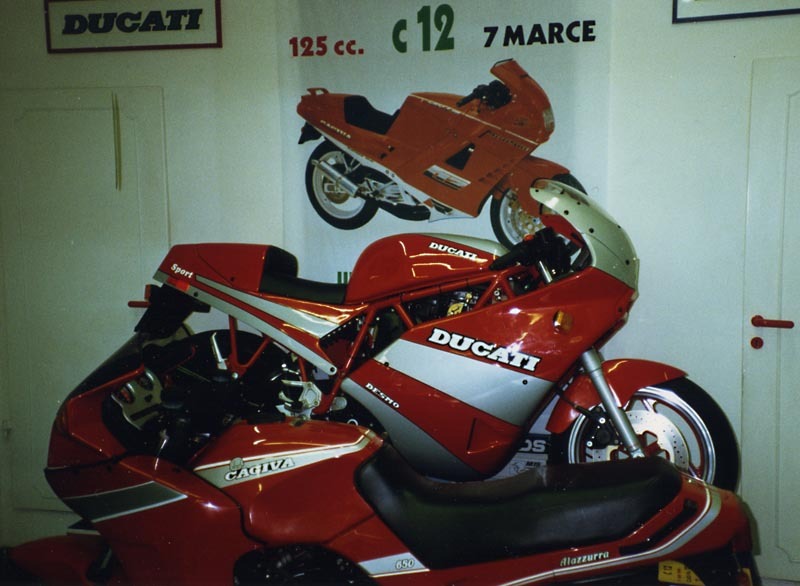 The F1 had stopped production but they had begun working with Weber on adapting a car-type carburetion system to Ducati motorcycles. The 750 Sport, named after the much-storied valve-spring Ducati twin of the 70's, was kind of an entry-level "parts bin special" based on the F1 frame and swingarm, wheels and engine from the 750 Paso, and pegs and instrumentation from the 851. Since so many of its components were developed for use on and in other motorcycles, the 750 Sport cost much less to engineer than either of its two contemporary models. 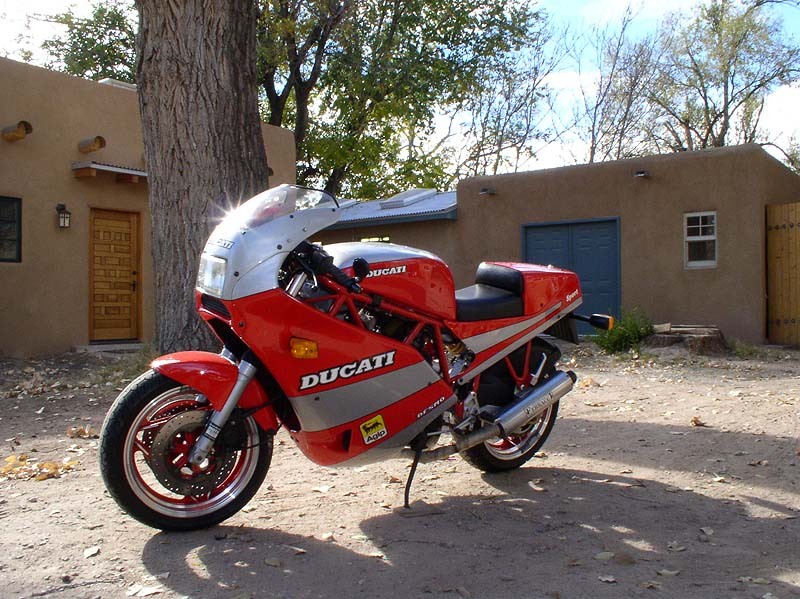 In any case, the 750 is not a perfect bike, and some say it is seriously flawed. Over time, however, many of the 750's flaws were corrected by their owners, and I for one find that mine is a joy to drive. The one major complaint I have is the shifting, which is notchy. Finding neutral must be done with the bike moving a pretty good clip. A common complaint about the 750 Sport (and the Paso, with which it shares many mechanical parts) is that the 16 inch wheels tend to stand up when braked in corners. I have yet to experience this myself, but I am not looking forward to it. Many folks convert their Sports to 17 inch wheels, which in many cases means pulling the entire front end off a Monster or Supersport because the brake mounts are different. According to Falloon, a mid-90's front end can be installed in toto. It looks like I will try the cheaper fix of mounting slightly narrower and taller tires on the rear and the stock size on the front. Since 750 Sports were imported into this country for only one year and there were only about 400 to begin witth, finding parts or technical support can be difficult. I am hoping that the rarity of this bike makes it worth while to hold on to for the long-term. 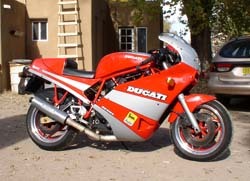 It is nice to have a bike that I can ride if I let a guest take the 851 out for a spin. Surely the Morini would have difficulty keeping up on any but the twistiest parts of the road. And once you get used to the notchy shifting and the elusive neutral, the bike is really fun to ride. Especially (as the seller told me) "at speed." Ian Falloon, 2000. Ducati Belt-Drive Two-Valve Twins, MBI Publishing. Mick Walker, 2002. Ducati Illustrated Buyer's Guide MBI Publishing. One of the problems of so small a community is that informational resources are scattered among different groups, where the 750 Sport is seldom the sole focus of attention. Some of the forums require registration to view entries, while others allow viewing but require registration to post or view photos. Certainly, if you find other pages, forums, etc that are helpful to owners of these somewhat rare machines, please send an email to ericatmayorericdotcom .